Introducing the 3-part Classic Human Skull by 3B Scientific. 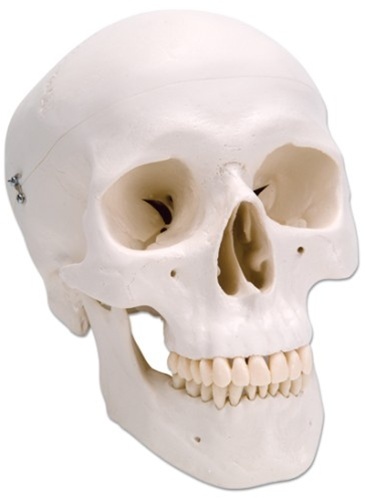 It is a high-quality cranium model brought to you by the industry’s distinguished company based in Germany, renowned in the field of manufacturing and distributing high-quality anatomical models, medical teaching aids, and charts that are a brand of choice amongst universities, hospitals, and medical offices. Anatomical models serve as indispensable teaching materials for professors, lecturers, and medical professionals while facilitating auxiliary education to students of anatomy and physiology. In addition to that, this classic human skull model is cast from a natural human skull specimen made of highly quality and durable plastic resin. It is handcrafted a by highly skilled staff to make sure that they adhere to strict industry standards. That is why it is the next best substitute for the real skull, a masterful carbon copy! This skull replica presents the precise appearance of openings, passages, and the sutures or seamline junction that characterizes the human skull. Which makes it the perfect study partner for students of cranial anatomy. It also is greatly endorsed for doctors and medical clinics for use in patient instruction. SCIENTIFICALLY ACCURATE- this classic human skull model is cast from a natural human skull specimen made of highly durable plastic resin. It is handcrafted by highly skilled staff to make sure that they adhere to strict industry standards. It is the next best substitute for the real skull, a masterful carbon copy! LIGHT WEIGHT- With its weight of 0.6 kg, it is very lightweight and easy to carry. Workmanship was excellent. Very good detail rendering. Excellent for practicing sketching skull. I bought specifically to use for artistic issues, would highly recommend. This skull model is high quality and more accurate model compared with other budge skull models. High price equals high quality and more accurate model, which is also indicated at the world of anatomical models. If you are the professional such as doctor, teacher, professor and so forth, I will recommend these products. For being one of the more economical models, it was extremely detailed, foramina, etc. Got an A on my anatomy practical, so I was very satisfied. This skull was perfect for my anatomy test on the skull. Very accurate, and well made. Thanks to this skull I received 100% on my exam. Recommend to anyone in anatomy! Great quality life-sized skull. The teeth are made from single molds on top and bottom which are glued into the jaw and face molds. They are quite strong and realistic looking with a different shade than the bone parts. The plastic is thick enough and strong to be very durable. It is also slightly flexible so I think it would be difficult to crack. The head cap fits well but the edges do have a slight radius and the gap formed from im-perfect planarity of the mating surfaces is only about .010 inches. In case you are interested, the distance between the centers of each eye is about 2.25 inches. - This was important for me.